So-called "zero-point energy" is a term familiar to some cinema lovers or series fans; in the fictional world of animated films such as "The Incredibles" or the TV series "Stargate Atlantis", it denotes a powerful and virtually inexhaustible energy source. Whether it could ever be used as such is arguable. Scientists at Jülich have now found out that it plays an important role in the stability of nanomagnets. These are of great technical interest for the magnetic storage of data, but so far have never been sufficiently stable. Researchers are now pointing the way to making it possible to produce nanomagnets with low zero-point energy and thus a higher degree of stability (Nano Letters, DOI: 10.1021/acs.nanolett.6b01344). Since the 1970s, the number of components in computer chips has doubled every one to two years, their size diminishing. This development has made the production of small, powerful computers such as smart phones possible for the first time. In the meantime, many components are only about as big as a virus and the miniaturization process has slowed down. This is because below approximately a nanometre, a billionth of a meter in size, quantum effects come into play. They make it harder, for example, to stabilise magnetic moments. Researchers worldwide are looking for suitable materials for magnetically stable nanomagnets so that data can be stored safely in the smallest of spaces. In this context, stable means that the magnetic moments point consistently in one of two preassigned directions. The direction then codes the bit. However, the magnetic moments of atoms are always in motion. The trigger here is the so-called zero-point energy, the energy that a quantum mechanical system possesses in its ground state at absolute zero temperature. "It makes the magnetic moments of atoms fluctuate even at the lowest of temperatures and thus works against the stability of the magnetic moments", explains Dr. Julen Ibañez-Azpiroz, from the Helmholtz Young Investigators Group "Functional Nanoscale Structure Probe and Simulation Laboratory" at the Peter Grünberg Institute and at the Institute for Advanced Simulation. When too much energy exists within the system, the magnetic moments turn over and the saved information is lost. "Our calculations show that the zero-point magnetic fluctuations can even reach the same order of magnitude as the magnetic moment itself", reports Ibañez-Azpiroz. "This explains why the search for stable nanomagnets is so difficult". There is, however, also a counterpart to this, in the form of an energy barrier, which the moment must overcome as it rotates. The height of the barrier depends on the material it is made from. The Jülich researchers investigated how quantum effects influence magnetic stability in detail using particularly promising materials from the class of transition metals. From their results they have established guidelines for the development of stable nanomagnets with low levels of quantum fluctuations. Their chart showing the suitability of different elements should serve as a construction kit for combining complex nanomagnets made from several different atoms. "We found the smallest fluctuations in materials with a strong magnetic moment which at the same time interacts weakly with that of the carrier material. Furthermore, the material should be chosen so that the energy barrier that prevents the rotation of the magnetic moment is as large as possible", summed up Prof. Samir Lounis, the physicist heading up the Young Investigator Group. "This knowledge has practical application: For example, grouping atoms together enlarges the total magnetic moment and an insulating carrier material should be selected instead of a metallic one". 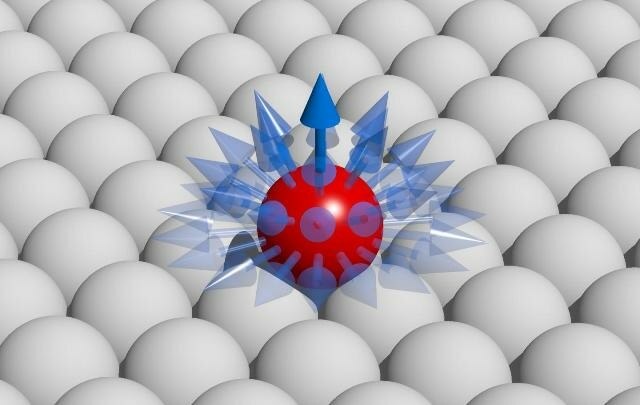 The scientists systematically investigated the connection between characteristic properties of the atoms and the strength of the magnetic fluctuations caused by zero-point energy. For this, they used so-called "ab initio" calculations, which are based only on generally accepted physical laws, without adaptations to experimental data. Ibañez-Azpiroz now plans further calculations to look at how the number of atoms influence the fluctuations.